We are all attracted to different aromas. My favorite aroma, hands down, is peppermint. But I also have a very strong love affair with lime. When I placed my initial order with Aromatics International, I ordered 4 ounces of lime essential oil. My supply is already growing low. When it comes to cleaning, I always reach for lime. 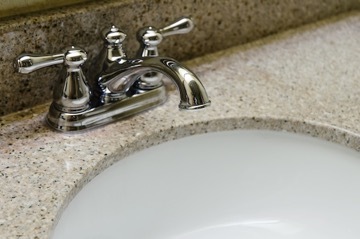 Nothing cuts grease and eliminates water stains and soap scum like lime. I always include lime essential oil in my kitchen foam hand soap. Sometimes I will turn to the this when I cannot get the grease out of some of my dishes using my organic dish liquid, or when I am cleaning out aromatherapy containers to be sterilized and re-used for Kevin and I. It was the recipe above that cinched it for me. This recipe is from Andrea Butje's new book "The Heart of Aromatherapy". She calls it a shower stall spray, but I use it on my bathroom sinks. Our guest bathroom sink is made out of some sort of synthetic granite/marble material. It is beautiful and I love it. Recently, I noticed that it started getting hard water spots on it that I couldn't get out. Being one of those women who likes her house looking brand new clean, this was distressing me. So I tried this spray. After using the sink, I gave it a quick wipe then sprayed it with the Magic Lime Spray. And every time I walked by, I sprayed the sink again. I did this for one day giving it a final spray before I went to bed. When I woke up the next morning, the first thing that Kevin said to me was, "You should see the sink!" There was not a water spot on it! I was so excited that I wrote Andrea an email thanking her for this wonderful recipe. The following are some of the therapeutic properties of the chemical components that make up lime essential oil. Anti-anxiety, anti-bacterial, anti-depressant, anti-infectious, anti-viral, antioxidant, astringent, CNS tonic, cooling, digestive tonic, diuretic, stimulates the immune system, provides lymphatic support and is a great tonic. On the emotional spiritual realm, lime helps us with relationships and creative energy. It helps us experience unconditional love, to speak our truth, and is purifying and uplifting. 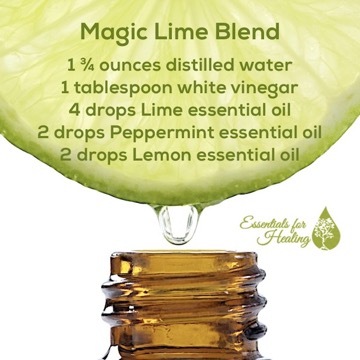 Lime also blends well with other citrus essential oils. I like to blend it with grapefruit, orange, and other citruses to make a clean smelling and uplifting foam hand soap. Just a safety note: Cold-pressed lime essential oil is phototoxic, but distilled lime essential oil is not phototoxic. So if you are planning to use it on any part of your skin that is exposed to sunlight, make sure to use distilled lime. Helpful tip: Lime combined with juniper, lavender and aloe makes a great acne face wash. I invite you to enjoy the magic of lime!